India vs West Indies Highlights, IND vs WI: India beat West Indies by an innings and 272 runs to take 1-0 lead in the two-Test series. India vs West Indies Highlights, IND vs WI 1st Test Day 3: India sealed their biggest win in Test matches in the first Test of the two-match series against the West Indies. Virat Kohli-captained India got the job done within three days to win by an innings and 272 runs. Kuldeep Yadav ran through the West Indies batting with five wickets and the visitors gave away cheap wickets having been bowled out in the morning. Asked to follow on, Kieran Powell tried to test the Indian bowling but found no support at the other end. This is also India’s 100th Test win at home. First Test, first century and now first Man of the Match Award for Prithvi Shaw. " It was a great win for the team, more happy for the team. Can't imagine my debut like this. Whenever you play international cricket, there's always a challenge. Was looking to play my natural game, like I do in first-class." Virat Kohli at the post-match ceremony: "Don't think you can compare the two conditions. That was a bigger challenge, something we don't experience day in and day out. Guys understand how to play in these conditions and they were clinical. That's not something for me to speak upon. I'm sure, as a team, they'd want to rectify their errors. We want to improve upon the things we need to do. Happy that the guys put in a clinical performance. Especially delighted for Prithvi and Jaddu. The way Prithvi dominated on debut was great to see. He just grabs his opportunity with both hands. Exciting to see from a captain's point of view. Jaddu as well, he's scored important runs for us in the past. We believe he can change games for us. Pretty good. If you see the first innings, the way Shami and Umesh ran in. Spinners are clinical in these conditions anyway. Kuldeep outstanding in the second innings, Ashwin in the first. Over rates had to do a bit with the umpires who were pushing us, not allowing us to drink water. Spinners bowl so much in India, we're never going to fall short of the overs anyway." Kraigg Brathwaite at the post-match ceremony: "Not the best of starts, credit to India. They showed us how to bat. Quite disappointed. Didn't get enough partnerships as a batting unit. Two or three partnerships would hold us very well. One thing we said in our meeting was to be as positive as possible. Not sure if Holder will be fit for the next game." R Ashwin in the post-match chat with Sanjay Manjrekar: "I wanted to get my rhythm back and I somewhat managed to do that today, I was a bit apprehensive yesterday. I had a good stint at NCA and before that in England. It's a fair amount of difference Kuldeep is talking about, playing with the SG and Dukes. This ball (SG) doesn't swing that much and adaptation takes time. I like the red SG and Kookaburra. The SG is slightly a better ball and Dukes is also right up there. But I am pretty disappointed with the SG ball at this point of time. When I started playing first-class cricket, the SG ball used to be top notch and you could bowl with it even after 70th or 80th over. The seam used to be standing up strong and straight, it's not the same anymore. I generally believe that in the second innings is better. This wicket was slightly better, it still is, hence I was surprised with the amount of attacking shots that were played against the spinners." Shannon Gabriel goes for a repeat of a boundary but only ends up finding the man in the deep. Ravindra Jadeja takes another wicket and Kuldeep Yadav is a safe pair of hands. West Indies are bowled out for 196 runs and India win by an innings and 272 runs. Game, set and match in three days. Ravindra Jadeja strikes and Shermon Lewis walks back leg before after scoring 4 runs. Pitched in line, went for the slog but misses it completely. Didn't even bother to consider a review. Would have been a waste either way, it seems. West Indies nine down. Bishoo was caught behind and Pant and Ashwin were convinced there was a glove. The umpire does not look convinced. Kohli calls for review. Reviews shows: THERE WAS GLOVE INVOLVED! WICKET! Ravindra Jadeja provides another breakthrough as Keemo Paul decided to play a shot on a slower delivery that was pitched short. Paul was enticed and he went for it, only to get his timings wrong. West Indies go 7 wickets down for 172. India need 3 wickets to win. SIX! Roston Chase smacks Ravindra Jadeja for a straight six. Excellent batting by the Windies duo in the middle and they have added together 34 runs in no time. Kieran Powell smacks the final ball of Kuldeep Yadav's double wicket-over for a boundary. Brings up the 100 for West Indies. A four and a six, R Ashwin has been hammered for 10 runs in two balls and Shai Hope has joined the bandwagon. Kieran Powell is on his way to his fifty, meanwhile on the other end. He is currently batting on 45 in 50 balls. Kieran Powell is leading the counter attack for West Indies as he is shoving both Kuldeep Yadav and R Ashwin all around the park for boundaries. This has not been a good day for Kuldeep Yadav at all. 50 up for West Indies! SIX! Shot delivery from Umesh Yadav, just missed his line by a whisker and deservedly punished by Kieran Powell. Massive six, and he brings up 50 for West Indies in style. Back for the second session - Ravichandran Ashwin comes into the attack and Kieran Powell faces the heat. Shai Hope on the other side. HERE WE GO! India are in control going into the Lunch with West Indies 33/1, trailing by 435 runs. Shai Hope and Kieran Powell in the middle for Windies. Guess the West Indies can only do better in the 2nd innings. And to be honest, they have done so a few times. Mohammed Shami has been replaced by Umesh Yadav as India continued to hunt for wickets in the 2nd innings. Mohammed Shami almost had the wicket of Kieran Powell as he managed to get him to edge the ball. The ball just fell short of the second slip fielder. India continue to hunt for wickets. Kraigg Brathwaite and Kieran Powell have given a solid start to West Indies with the bat early on. Both Mohammed Shami and Ravichandran Ashwin have not been able to pick up a wicket so far. This is a better opening stand than in the first innings by the two. 2nd Innings - HERE WE GO! Kraigg Brathwaite and Kieran Powell out to bat for West Indies. Mohammed Shami starts with the new ball for India. HERE WE GO! WICKET! R Ashwin strikes and Shannon Gabriel has been stumped out by wicketkeeper Rishabh Pant. West Indies are all out for 181 and India have decided to enforce the follow-on/. With West Indies needing 275 runs more to avoid follow-on, Devendra Bishoo has started charging against the Indian spinners to add quick runs. With 9 wickets, it is a good strategy - either go hard or go home. DROPPED! Devendra Bishoo gets a knick off Ravindra Jadeja and the ball hits the gloves of Rishabh Pant before racing towards the boundary ropes, only to be stopped by the fielder. Pant's reaction time was slightly delayed and Jadeja was not pleased. R Ashwin comes into the attack and he almost got Chase' wicket with a top spin. The bounce surprised Chase and he could just manage to get an edge on it. The ball dropped just short of Rishabh Pant's gloves. FOUR! Roston Chase smacks Kuldeep Yadav straight down the line and he brings up his 6th Test fifty. Smart batting from the right-handed batsman and India need to get him out quickly. FOUR! Roston Chase hammers Kuldeep Yadav for another four. Played it inside out as the ball landed right below his bat. Brings up 150 for Windies. Kuldeep Yadav has really struggled on the surface. He is not getting any spin and he has allowed both Chase and Paul to get under the ball and smack him for boundaries. This has been a poor start for India with the ball. 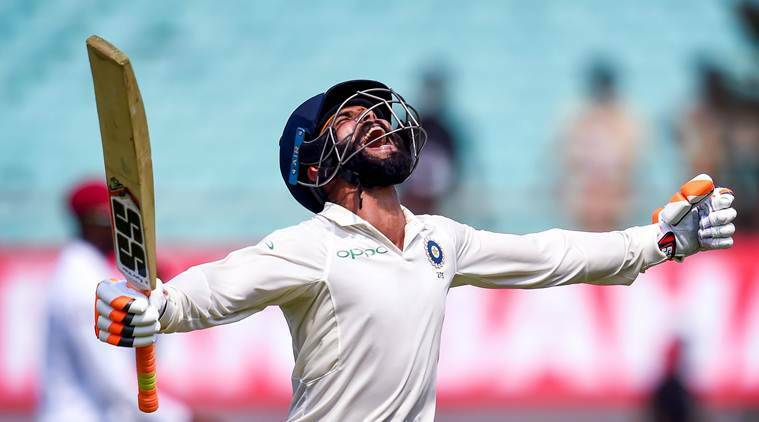 India vs West Indies Live Cricket Score 1st Test Day 3 Live Streaming: Virat Kohli and Ravindra Jadeja ravaged a clueless West Indian attack with strokeful hundreds as India headed towards a demolishing win with another near-perfect performance on day two of the first cricket Test here. The hosts piled up 649/9 in their first innings before reducing West Indies to 94 for six in 29 overs when stumps were drawn for the day. After Prithvi Shaw’s pehnomenal ton on debut on day one, skipper Kohli (139) and Jadeja (100 not out) made hundreds as India put up a mammoth 649 for nine in their first innings before declaring at tea. It was a maiden Test ton for Jadeja, who had to wait for almost six years to reach three figures in the five-day format. In response, the West Indies were in all sorts of trouble, first against pacer Mohammad Shami before the spinners cleaned up the middle order. They trail India by 555 runs and the hosts will fancy themselves to bowl them out twice by day three.